You won’t believe it … but we’re doing another huge giveaway on Instagram!! This time we’ve partnered up with Hooligan photographer @jason_arnold_underwater to bring you some inshore insanity. 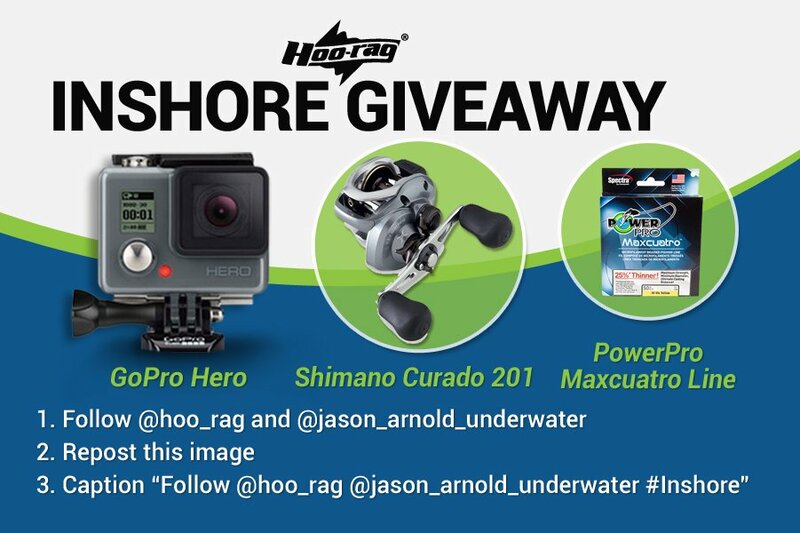 One grand prize winner will receive a GoPro Hero camera, a Shimano Curado 201 Baitcast Reel, a pack of 150 yd. PowerPro Maxcuatro braided fishing line and 5 Hoo-rags! 10 runner-ups will each win a Hoo-rag of choice. Winners will be announced on Friday 8/14. You can enter once a day. Please be aware that your profile must be public for us to see your entries! This promotion is not sponsored, endorsed or administered by, or associated with, Instagram. You must be 13+ years of age to enter, release Instagram of responsibility and be a legal resident of the United States or Canada. Hi, are Malaysian allow to enter this contest? because we have been posting this post for almost a week. Awesome!!! Just wanna make sure… we can enter each day till 8/17 right?